All those U.S. soldiers who died in Vietnam, died in vain. So says Joe Repya, the man who wanted to be Minnesota's Republican Party Chair and in the past has tried to quiet any questioning of the occupation in Iraq by questioning the questioners' patriotism. "I want to see victory for the Iraqi people. I want to see a safe nation. Because there's 4,000 of my brothers and sisters who have paid the ultimate sacrifice. And I don't want to see them die in vain , much like the 58,000 that served with me in Vietnam died in vain." Really? Giving your life for your country is dying in vain? For the moment, let's take Joe at his word and accept that in his mind, this is true. That means his argument for staying in Iraq is somehow tied to avenging the deaths of US soldiers in Iraq and Vietnam. Joe, I can understand your anger over having lost friends in that war. But your anger clouds your logic. Those who ignore the lessons of history are doomed to repeat the mistakes. Vietnam taught us you can't fight for a country where its people are against you. Every poll in Iraq shows that the general population doesn't want us there. When the people are against you, the enemy is given shelter and can easily blend in. It's hard to fight a force you can't see. In the same WCCO interview, Joe admits mistakes were made in how the Iraq war was conceived and executed. Why did those mistakes happen? Because "patriotism" was used as a rhetorical shield against serious questioning of what the Bush administration was doing. It's a tactic Joe and his party has employed liberally in the past. I witnessed this myself when Joe questioned the patriotism of peace supporters for not applauding when the mother of a fallen soldier she said her son would have died in vain if we do not win the "war" in Iraq. What are we fighting for in Iraq? There's no consensus on what that is. Is it to find those elusive WMDs, bring democracy or for the sake of those who have already died? It's hard to have "victory," which Joe has said "there is no substitute for," when you don't know what victory looks like. But I know what defeat looks like. Defeat is when our US Constitution is shredded, our liberties curtailed, and our economy collapses under a huge war debt. If we're looking for a clear-cut definition of victory, returning our constitution, our liberties and our good economic (and diplomatic) standing in the world would seem to be something we can all agree on. As Will Rodgers once said, the first thing to do when you find yourself in a hole is to stop digging. I suggest we do it before we reach 58,000 lives lost. Politics, just like rust, never sleeps. Both may be factors in the collapse of the 35W bridge. But there's a chance you'll never get the full story on either of those factors, thanks to the National Transportation Safety Board's decision not to hold an interim public hearing on the disaster that took 13 lives. The NTSB recently voted 3-2 to not hold the public hearing, angering Minnesota Congressman Jim Oberstar — who has frequently been critical of the NTSB's handling of the investigation. Inside Minnesota Politics and The UpTake have obtained the written dissenting opinions from NTSB Commissioners Deborah Hersman and Katheryn O'Leary Higgins. The dissent reveals not only displeasure with the other commissioners' decision not to hold a public hearing on one of the worst bridge collapse disasters in U.S. history, but the document also gives us a glimpse into likely factors of the collapse. "The public hearing can then focus on other relevant issues, such as the design approval process at the time the bridge was built and its evolution into the process that exists today; national bridge collapse or failure history; inspection criteria and procedures; corrosion standards; records retention requirements; national, state and local oversight; and other areas that could help us learn how to prevent a similar collapse." There's that word "corrosion" again. Rust is an unavoidable reality for bridges unless you paint and maintain them regularly. The frequency of that maintenance (not just inspection) is where politics comes in. Democrats in Minnesota have been pointing fingers at Republican Minnesota Governor Tim Pawlenty's administration, which has been strangling the budget so the dollars to do maintenance properly have not been there. More political factors: NTSB Chairman Rosenker has spent a career in Republican politics starting with CREEP, the Nixon Re-Election group, where he was deputy director for radio and TV. He has worked in nearly every Republican campaign from the 1970s to the present. If funding for bridge maintenance turns out to be a factor in the collapse, Republican Governor Pawlenty could end up taking the political fall for it. "The downside of not holding a hearing is significant not only for this accident and for the transportation community, but also for the Board. We believe we would be abandoning our important duty to educate and reassure the traveling public of an independent, transparent, credible investigation after a tragic accident of national scope. And, after our decision not to hold a public hearing on the Comair flight 5191 accident in Lexington, Kentucky - for which the Board was roundly criticized - we believe our reputation for independence and transparency would suffer further. "This is one of the rare accident investigations the Board has undertaken that has involved the total collapse of a major interstate highway bridge. Given the number of interstate bridges that exist in this country, the age of those bridges, and the use of those bridges, there is a significant need to explore whether this accident is likely to remain rare in the future." Here is the list of subcaucuses, the number of votes each one got and the resulting number of state delegates. Disclosure: I was a delegate to the SD 38 Convention and was in the "uncommitted" caucus. Is Franken really the "Front Runner" for the DFL US Senate endorsement? This fall it's Al Franken vs. Norm Coleman -- Mike Ciresi and Jack Nelson-Pallmeyer just doesn't have the support to win the DFL US Senate endorsement. That appears to be the proclamation from the legacy media based upon Survey USA's KSTP sponsored poll and the TV station's online post about the poll. According to KSTP Franken is the "front runner" But if you take some time to dig into the numbers, and know a little bit about the political process, you know that outcome is far from certain. First, the poll was done among Republicans, Independents and Democrats. Republicans and Independent voters don't determine the DFL endorsement, Democrats do. And when you look at just the Democratic voters numbers, Al Franken pulls 79%, and Mike Ciresi 75%. That's closer than the margin of error in the poll (when you narrow the sample to just Democrats). Jack Nelson-Pallmeyer polls just 58% among Democrats, but there are nearly twice as many undecideds (18%) as there are in matchups between Franken/Ciresi and Colman. That's not surprising since Nelson-Pallmeyer's campaign is not very well known in the general public. Adding in just half of those undecideds puts Nelson-Pallmeyer just a few percentage points behind Franken and Ciresi. Second, it is now delegates, not voters, who are going to determine who the DFL US Senate nominee is going to be. All three candidates have agreed to abide by the endorsement, which means there's only going to be one major candidate running in the DFL primary this September. This poll was done among the general public not delegates. The three DFL candidates are better known to the delegates than the general public. And as noted above, even among the general population of Democrats, the race is too close to call or even a three-way race. So for KSTP to use this poll to call Franken the "front runner" is not based on fact, not based on their own poll, and takes a real stretch of the imagination... or just a lack of attention to detail to do. KSTP should stick to the facts on this one -- that is Franken does better in this poll in a head-to-head matchup with Coleman than Ciresi or Nelson-Pallmeyer do -- and leave deciding who the DFL "front runner" is to the delegates. Whoops. That rust on bridge and lack of maintenance might have had something to do with the 35W bridge collapse after all. NTSB Chair Mark Rosenker is backing off from his earlier statement that a design flaw in the gusset plates was the "critical factor" in the collapse of the bridge. As reported here earlier, Minnesota Congressman Jim Oberstar took him to task for that statement. "Please be assured that it was not my intent to get ahead of the ongoing NTSB investigation or to hypothesize about the root and contributing causes of the bridge collapse. "It was not my intent to characterize this single conclusion as the possible probable cause determination of the Board." What he MEANT to say was corrosion was not found on the gusset plates where the collapse likely started. So while the gusset plate design flaw may not have stopped the bridge from collapsing, it may not be in Rosenker's words "the straw or straws that broke the camels back." You can read a pdf of Rosenker's letter here. The National Transportation Safety Board usually follows a strict policy of not announcing the cause of an accident until the investigation is completed. Yet last week even though the NTSB reported it had not determined the probable cause of the 35W bridge collapse, NTSB Chairman Mark Rosenker said a design flaw in the bridge's gusset plates "tells us why the bridge collapsed." Minnesota Congressman Jim Oberstar is taking Rosenker to task for his remarks, calling them "unfortunate" and suggesting that they could compromise the NTSB's investigation. "Such announcements undermine the process and create the potential for committing the board to conclusions that will be difficult to change if the subsequent investigation suggests other conclusions. "I strongly urge you to adhere to the Board's established process of not announcing the cause of an accident until the investigation is completed." The UpTake, a Minnesota based video journalism project I work with is going to be getting a lot more national attention. Next New Network’s Veracifier will be promoting and showcasing video produced by The UpTake's correspondents. Most of those correspondents are in Minnesota, but with Veracifier's help The UpTake will soon have correspondents all over the U.S. to cover the 2008 campaign and election. The first video from that partnership -- "New Orleans: From Evacuation To Eviction" went online today at both organizations' web sites. Watch it on The UpTake or on Veracifier. The joint project is called Ground Hounds and will be on the ground at political events, giving individual reports on the local unique angles that are often lost in the spectacle of an election year. The UpTake is a nonprofit media startup created by a diverse team of Minnesota-based political, business and media activists, including leading video blogger Chuck Olsen. The UpTake blurs the line between citizen and traditional journalism by training citizen correspondents in the practice and principles of journalism, sharing editorial responsibility with the public through an evolving interactive editorial calendar, then publishing a product that meets standards of fairness and accuracy. Correspondents who consistently produce the most compelling stories will become Veracifier’s Ground Hounds. The UpTake will focus specifically on the 2008 elections, including the RNC in Minnesota and the DNC in Colorado. Ground Hounds’ video reports will run every week on the Veracifier network. ‘Hounds’ will have profile pages where people can follow their personal blogs and videos. Veracifier and Next New Networks will work with The UpTake to harness its array of talented network producers and stars to support training sessions for aspiring independent journalists. With a little help, anyone can commit an act of journalism. Probably the most significant aspect of Tuesday's US Senate DFL debate at Minneapolis Roosevelt High School was not the candidates, but the audience. With the election still nearly a year away, the debate drew enough people to fill the auditorium's lower level. A good portion of those in the audience were there to back Jack Nelson-Pallmeyer. His campaign volunteers and supporters had packed the auditorium. Nelson-Pallmeyer does not have as much name recognition or money as Mike Ciresi and Al Franken. But he is apparently strongly organized in Minneapolis where he unsuccessfully ran for the 5th Congressional District DFL endorsement in 2006. If you want style, we give you something different. A few quick jokes from moderator and DFL State Chair Brian Melendez and then The UpTake-O-Meter (patent pending) on the response each candidate got when introduced to a crowd of about 700 people. This is Jack Nelson-Pallmeyer's backyard and "Back Jack Pack" which jammed the auditorium let everyone know that. One by one the barriers to creating your own mass media have been coming down. First blogs let anyone publish their own newspaper, then podcasts let anyone publish their own radio show, now online videos let anyone put out a TV show…if you have the equipment and technical know how. Cameras and editing software have become less expensive and easier to operate. But creating and distributing your own video news story can still be a complicated and frustrating proposition. The UpTake, a Minnesota based non-profit group, which I am the Executive Producer for, is stepping in to get rid of that last barrier. Here's a video about that. This weekend The UpTake has scheduled its first video citizen journalism class. It’s free and open to the public (registration is required ahead of time through Wellstone Action). The class will cover the impact video citizen journalism has had and can have, cover story telling techniques and some of the nuts and bolts of shooting and editing video. As any journalist will tell you, covering news is really a team sport. This is especially true in video citizen journalism. It takes people who can shoot video, contribute story ideas, research, and coordinate other volunteers. This weekend’s class will give you the blue print of how to work as a team. Everyone has their own reasons to do video. For some it’s a cause, for others they want to be famous. For The UpTake, it’s to preserve that First Amendment right to free speech in what can be its most potent form –television. The power of TV has long been reserved for the few. And with media consolidation, those few are becoming fewer. The revolution will not be televised, but it will be uploaded. The Video class for Citizen Journalists is on Saturday October 27, 2007 at the Galaxie Library in Apple Valley, Minnesota, 11am to 3pm. Free registration for the class here. How does supporting the University of Minnesota with a paid email account equal using taxpayer funds for a Congressional campaign? It doesn't. But reality has very little to do with anything when it comes to Republican smear campaigns in Minnesota's 2nd Congressional District. Paid Republican operative Michael Brodkorb launched the smear campaign only a few hours after Iraq War Veteran Steve Sarvi filed to run against one of Brodkorb's former employer's clients -- Congressman John Kline. Brodkorb, who continues to assert to the media that he is a reliable news source, assumed that since Sarvi's campaign manager Eileen Weber had used her U of M alumni email address to send out a press release that some campaign law must have been violated. However, it turns out tax payer dollars are not involved. Weber pays for the account because she believes in supporting the University of Minnesota. Brodkorb, who has never let facts get in the way of a good smear, apparently did not check on this before publishing his story. Weber says Brodkorb has been contacted about the error, but as of now he has not corrected or updated the post. We've grown accustomed to the lies and distortions coming out of Brodkorb's media enticing rumor mill. Thank goodness the media has learned its lessons and doesn't take what he says as gospel. Star Tribune reporter Mark Brunswick was smart enough to check out this latest distortion with Sarvi's campaign first and left Brodkorb's smear out of his printed story. Brunswick knows what a lot of other media folks now know, Brodkorb's intent is to misinform for political gain. Update: Mr. Brodkorb claims no one from the Sarvi campaign has contacted him about his error. Yet he apparently has read about it and has not corrected it. He's posted again insisting this was a "taxpayer-funded e-mail account". Silly Michael, when you pay $60 a year for an email address at the U of M (as I did for years) that's not a tax-payer funded email account. That's an alum funding the University account. The dollars are going the wrong way for it to be taxpayer funded. Face it Michael, you goofed. That's why the media doesn't take you seriously anymore. Steve Sarvi filed the papers today to run for Congressman John Kline's seat in the 2nd Congressional District. Sarvi is seeking the DFL endorsement. If he runs again, Kline , a Republican, will be seeking his 4th house term. 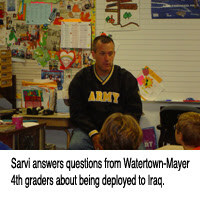 For new listeners and readers I'm repeating an interview I did in May with Steve Sarvi while he was still in Iraq. Just as it takes courage to jump out of a plane or serve in Iraq, it takes courage to leap into politics. Steve Sarvi has done both and has been mentioned as a possible DFL candidate to face Congressman John Kline (R- MN02) in 2008. Steve has been in the Army for nearly 20 years and is on track to be part of the longest deployed Minnesota National Guard unit in Iraq. 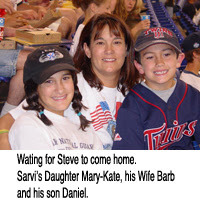 He's been there since March of 2006 and is hoping to return home in late July or early August. He's also the former Mayor of Watertown, MN. Inside Minnesota Politics has an exclusive audio interview with Steve you can listen to here. Since he's on active duty in Iraq, he really can't talk much about running for office, but we did get to talk about how he's helping local governments get started in Iraq and how the City of Victoria, Minnesota (his employer) has been very supportive of him and his family while he's been in Iraq. On his website, Steve describes his political leanings. "Simply put, I am a Democrat. That my ideas and values spread from center to left of center, speaks to the strength of the Party. I appreciate the willingness of Democrats to embrace the things that bind us together, rather than focus on that which sets us apart". Here are some text excerpts from the interview. The entire interview is in the podcast audio. Why are you in the military? Why do you take this type of dangerous work to do? 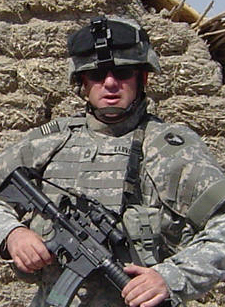 Steve Sarvi: I've been in the military since I was 17, other than a break in service when I got off of active duty. I felt like I needed to give something to my country at a young age and found I was good at it. I guess I've really never had that question asked of me... why do you do it? I guess someone needs to do it. I'm good at it. I'm good at working with my soldiers and I get a lot of satisfaction for the work that I do. It certainly is not an easy thing to do, obviously, to volunteer for something like this. To say good bye to my family, my friends, to work... and have to come over to an environment like this. But I don't think I could have looked my soldiers in the eye and watched them go off and stayed behind. That's just not the kind of person I am. What are you doing in Iraq? Steve Sarvi: I'm what's called a Civil Military Affairs Officer. And what we're doing is helping the local Iraqis with reconstruction projects. My main focus is in rural villages ...they're in some very bad shape as you can imagine. Infrastructure wise they're in need of just about everything. So what we do is we go into these areas and we do an assessment. We meet the people. Find out what their needs are. And then we work through with the local leaders either the Sheik or the village Mayor. And we work through with them the process of doing projects for them. But what we really want them to do is learn how to do it themselves. So it's a real mentorship process to get the locals to figure out ways to identify projects that are needed and then go to their own government and get approval. What the military does then is come in with funding for smaller level projects. So we're able to provide the funding while they end up doing all the heavy lifting and getting approvals through their government. It sounds like you're helping people learn how to run a local government. Steve Sarvi: Yes, to a certain extent. It's different than the work I was doing in Kosovo, where I was actually working and helping to mentor a small village government. Here the local governments are almost non-existent. So we're not really doing much as far as that goes with setting up a government and talking through process and procedures. It's much more "we need a school in this village" so how do we engage the minister of education. How do we insure that we're going to have teachers come here. How do we get the approvals through them. And then as we provide the funding we like to use the local workers because unemployment is so very high. We like to hire locals to actually build the facilities that go into their own villages. As you can imagine it's a very complex environment. There's inter-tribal conflicts. There's conflicts between individuals. You've got construction workers. You've got contractors who are all basically tottering on the edge and they need jobs and it's a life or death matter to them. So there's a lot of emotion. There's a lot of pent up demand. This is four plus years since the invasion. They thought their lives were going to improve immediately. So there's a lot of expectations we have to knock down as well. It's a growing process. They get infrastructure needs identified and some taken care of. And on our side we gain security by becoming friends to them, in some sense. And they look out for us. It's working out well in the areas we operate in. How has your work in local government helped you out with the work you do now in the Army? Steve Sarvi: It seems like I gravitate towards these positions. Same with in Kosovo. I'm an infantry soldier. And as a platoon Sergeant, my job is to train my soldiers for combat. And I did that at Camp Shelby when we were going through training and for the first three months that we were here. But we quickly learned that we needed to do civil-military projects even in the remote areas. My battalion reached out to me because of my background in the city government. 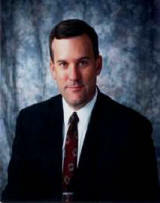 I've been a city administrator for the City of Lanesburo, City Administrator in Watertown and currently in Victoria. And plus six years as the Mayor of the City of Watertown. So a lot of the issues, as far as infrastructure goes, a lot of those things apply. Learning how to engage people, talk to them, figure out what their needs are, work around issues... interpersonnel issues. A lot of those skills I think directly reflect on how we do it. Plus of course we got to bid projects. The bidding process, as you can imagine it's a far different environment than what you have to deal with in the United States. But I understand the basics of it from the work that I do in the US and I've learned an awful lot being over here about the way that they work. You gravitate towards these positions no matter where you are in life. And for some reason whether it was in Kosovo or here, I just end up doing these types of projects. Maybe it's my strong suit. And I get to see a different side of the war than most people get to see. What kind of support have you received from home to get through these months, these years that add up when you're overseas? Steve Sarvi: I'll tell you, without a family, without friends, I can't imagine getting through this. So my wife, my kids have been just wonderful about it. It's difficult of course, but they understand what I'm doing and why I'm doing it. And they've been fully supportive. My family has been completely supportive. Work (City of Victoria) has been just marvelous. The City of Victoria has time and again been called to be true patriots. What they've been doing is maintaining my current salary and I just give them my guard pay. So I'm not losing any money by being over here. And that's a huge financial burden for many soldiers that come on active duty from the guard. The end up taking quite a large pay cut. But the City of Victoria in my case, and many employers in Minnesota are doing the same thing, and it's very encouraging for us. Without that support system, you take your eye off of what you're doing over here. You're worried about what's going on at home. You have to stay focus obviously when you're here. We wish you the safest travel from Iraq back to the United States. Steve Sarvi: Thank you. And I hope everyone pauses for a moment on Memorial Day and thinks of the soldiers that we've lost not only in this war, but in other wars. Minnesota Governor Tim Pawlenty has a tough choice to make on Monday. Legislators have sent him a letter indicating he can either show up to tell a legislative committee how the money he said he had for the 35W bridge disappeared just as suddenly as the bridge did, or he faces delaying other transportation projects. The "Transportation Contingent Appropriations Group" is the legislative commission that must approve Governor Pawlenty's request to use money from the state's reserves to cover costs for the 35W bridge rebuilding. Earlier this month, Governor Pawlenty convinced legislative leaders that a special session on transportation was not needed because the Federal Government was paying for the 35W bridge reconstruction and the state had plenty of funds to cover its obligations. Since then, President George Bush has threatened to veto the legislation that contains the funding for the 35W bridge. Also, the Minnesota Department of Transportation has said it needs to use the state's reserve funds to pay for the 35W bridge or it will need to delay other construction projects. Senator Steve Murphy: Lt. Governor, I believe the question is: are there going to be other projects delayed because of this delay in payments from the Federal government? Molnau: I’m hoping that there will not be. I don’t believe so. I think we do have some resources that we can, can move to if we have a project we’re going to let, we can bond rather than pay out in full right now, if we have to do that, and then reimburse the bonds using those Federal dollars. So, I think we can pretty much take care of what we need to take care of on this project, if that’s what you’re asking for, with not, hopefully not a lot of negative impact to other projects or delays. Murphy: The bonding authority that you’re talking about, where is that from? Molnau: I’m assuming… now I think we can bond for something, that we do have some authority to do some additional bonding. So I think we can do that…ah... on some of it. Knowing that it would be short term, or we can do short-term borrowing from other accounts, and we can do that. Molnau – We could use some of those, yes but we also have opportunities, at least from what we’ve heard …as we’ve talked to the department of finance of being able to… and we’ve done this before knowing there are dollars coming in behind it to do some short term borrowing. The commission has sent the Governor a letter asking him to appear before it on Monday to explain why the financial information he and the Lt. Governor gave lawmakers last month turned out to be wrong. Because of the unprecedented nature of the request, we believe it will be to the public’s benefit for a full discussion of the request made by your administration. It is our hope that you, and your representatives, will attend the meeting to provide insight into the reasons behind the request and the delay in federal funding promised to the state to meet the reconstruction needs of the I-35W bridge. We look forward to the opportunity to discuss this matter during this important public meeting. The commission meets Monday at 11 AM in room 15 of the State Capitol. If Governor Pawlenty shows up, he will face some rather pointed questions such as, "how did the money you said we had disappear?". If he doesn't show up, it is very likely the Department of Transportation will need to delay construction projects, which will cost taxpayers even more money. US Senator Amy Klobachar (D - Minnesota) has made a couple a votes that have upset some progressives. In this interview I did for AM950, she talks about her vote on the Foreign Intelligence Security Act also known as FISA and a resolution condemning a newspaper ad that said General Petraeus was “cooking the books for the white house” when he gave his report on Iraq. We also talk with her about the State Children’s Health Insurance Plan that she supported, but President Bush has threatened to veto and legislation she sponsoring to protect consumers against questionable cell phone charges. Analysis Video: Which Party Can Win Ramstad's Seat in 2008? It’s been 17 years since anyone other than Jim Ramstad has represented Minnesota’s Third Congressional District. Now that he’s decided not to run in 2008, the question is which party is more likely to win the seat. Ramstad has won his seat by huge margins. So on the surface it seems like a safe bet that any other Republican would have the same advantage in the third district. But a look at voting trends from the last several elections indicates it may not be that easy. Let’s look at how the Third District has voted in recent races that Jim Ramstad was not in. First there’s last year’s US Senate race. DFLer Amy Klobuchar won the third district by 15 percentage points. Hardly a close race. But those same voters also backed Republican Governor Tim Pawlenty by a larger margin than he got statewide. In the other statewide races, which tend to be less partisan the Republican Attorney General candidate was just 311 votes better than the statewide winner DFLer Lori Swanson. The DFL won the State Auditor’s race in Ramstad’s district, but lost the Secretary of State’s race. So the Third District has a lot of ticket-splitters. It’s not a shoe-in for a Republican candidate. But trends indicate this may be a Congressional seat the DFL could take in 2008. The DFL has picked up a total of seven state legislative seats in Ramstad’s district since 2004, indicating the area may be trending Blue. This weekend hundreds of people marched to the State Capitol building to call for an end to the occupation in Iraq. A much smaller group gathered for a counter-protest to support the occupation. Later some of the peace group marchers went to US Senator Norm Coleman's home in St. Paul and found him in the ally behind the house. He then came out and talked to the group for about 20 minutes. Together these videos provide an excellent overview of the issues and what happened on Saturday. If you like what you see, the videos are also in YouTube. Rate, comment and share them with others. It will help raise the visibility of what happened Saturday. Some people are faster than others when it comes to sensing the world is collapsing underneath them. Governor Tim Pawlenty changed his tune on the gas tax within a day or so of the I-35W bridge collapse and now says he's open to a tax increase to make our roads and bridges safe. Fellow Republican Steve Drazkowski, who would like to be the one who succeeds Steve Sviggum in the legislature, apparently is not as in tune with what is going on around him. Indisputable evidence that the state's transportation infrastructure is crumbling apparently took about a week to sink in on him. On the eve of the special election of Sviggum's 28B seat, Drazkowski finally said he might be open to a gas tax increase. Unlike Pawlenty and Drazkowski, DFLer Linda Pfielsticker didn't need a bridge falling down to figure out that Minnesota's roads and bridges needed more funding. Her campaign for the 28B seat has been consistent: more funding for transportation is needed and all possibilities, even (gasp) a gas tax increase needs to be considered. And while consistency in a position is the expected norm in politics, I remember Winston Churchill who said "I'd rather be right than consistent" and realize that ideally politics should be about pursuing the best solution instead of an ideological solution. And I might have some hope that Drazkowski has come around to the Churchill way of thinking except for a few things. 1) If you're going to have the courage to change your mind, shout it from the rooftops and show your conviction. Drazkowski has done little on this front. His website still touts his draconian position on transportation: "A gas tax increase would cripple the economy in House District 28B. " 2)Even the usually conservative Winona Daily News realizes that Drazkowski is a fanatic. In it's endorsement of Pfeilsticker, it notes that Drazkowski's platform is focused on wedge issues. "We believe his campaign focused entirely too much on wedge issues, aimed at pandering to small but vocal segments of the GOP. Abortion and immigration are federal hot-button topics meant to polarize voters. Right now in this politically charged environment, we need to talk about what issues really matter, not what issues really raise our blood pressure." So to borrow another phrase, a leopard may be able to change its mind, but not its spots. Drazkowski has been a fanatic on his stance that no additional funding is needed for just about anything government does. While Drazkowski's election eve conversion should be applauded, Pfeilsticker has shown herself to be the more thoughtful candidate and doesn't need to be hit on the head with a falling bridge to have an open mind. Tomorrow voters in 28B will have a pretty clear choice on how to fix the state's crumbling transportation infrastructure. One candidate favors more funding, the other thinks current funding is enough. Here's the side by side comparison of the Republican Steve Drazkowski and DFLer Linda Pfeilsticker's responses to the Minnesota Chamber of Commerce's questionnaire. In order to strengthen Minnesota's economy, strategic investment in transportation infrastructure is necessary. How do you propose to fund Minnesota's transportation infrastructure to assure the safest, most cost effective transportation system that will meet the economic and quality-of-life needs of our state? Transportation is vital to the economic stablity of our region and state. We have to look at all forms of funding to determine what can be most effective and fair to improve and maintain our transportation system. It appears Drazkowski is ignoring the reality even his fellow Republican Governor Tim Pawlenty has now recognized. Minnesota simply does not have enough money to keep its bridges in shape and needs to raise taxes. A hat tip to Ollie at Bluestem Prairie for pointing out the MN Chamber of Commerce questionnaire. One big roadblock to increased transportation funding has crumbled in the wake of the I-35W bridge collapse. On Tuesday voters in portions of Goodhue, Wabasha and Winona counties will have a chance to clear out another roadblock. The biggest roadblock to increased transportation funding, Governor Tim Pawlenty, is finally open to increasing the gas tax after vetoing transportation bills two years in a row that contained a gas tax increase. Too bad it took an highway bridge falling down during rush hour to change his mind. The question is: have the other roadblocks to safer roads and bridges changed their minds? If you remember, the last transportation bill passed with enough votes to overcome a Pawlenty veto. But when it was time to override that veto, several (mostly Republican) legislators bailed. The DFL is still several votes short of a veto-proof majority in the House. On Tuesday voters in House District 28B will decide if they want a vote for or against future transportation funding bills. Transportation: A gas tax increase would cripple the economy in House District 28B. Families and businesses are struggling with today’s high gas prices, and raising the gas tax would exacerbate the problem. Steve supports the Governor’s plan to bond for $1.7 Billion in road improvements and to pay the bonds back with the constitutionally-dedicated motor vehicle sales taxes that are currently collected from Minnesotans. The bonding plan that Drazkowski cites is actually more expensive than just raising the gas tax because bonded money is borrowed money. And borrowed money comes with an interest rate. As far as keeping transportation money local, if every county did that our rural counties would have incredibly poor transportation infrastructure since most of that money is raised from taxes in the metro areas. "My stance on transportation funding has been very constant. We need to look at all funding options. Bonding, a gas tax, and other sources of revenue all must be explored so we can pass a quality transportation bill that addresses our transportation issues and is financially responsible." Note that Pfeilsticker leaves all funding options open. That's probably a good idea since even Minnesota's Transportation Commissioner/ Lt. Governor Carol Molnau admits that the gas tax her boss Governor Pawlenty vetoed would need to be at least three times as high to fix the problem. The gas tax, like all sales taxes is a regressive tax and unfairly burdens the poor. Fixing the problem will mean looking to taxes based on the ability to pay such as the income tax. Drazkowski is against any type of tax increase. On Tuesday, it appears 28B voters have a pretty clear choice on safe bridges, Pfeilsticker's open mind or Drazkowski's roadblock. Wise voters pick the path to safety with the fewest roadblocks. Congressman Jim Oberstar talks about how he has introduced a bill to fund rebuilding the I-35W bridge that collapsed. Currently the cap on emergency funding is $100 Million. Oberstar's bill would increase that to $350 Million. Congress made a similar exception earlier this year when a bridge in California was destroyed in a tanker fire. Video provided by Congressman Jim Oberstar's office.